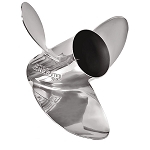 The polish finishing process includes wedging the leading edge so the prop cuts into the water versus chopping; the blades are thinned in areas while maintaining the integrity and the trailing edge cup height is modified all to gain 300 RPM. Because of the 300 RPM gain consideration should be given to increase 2 inches of pitch over a stock Maximus. If moving from the Bravo 1 Lab Finish propeller to the polished finished Maximus generally move 2 inches of pitch down and to the 15.3-inch diameter. Example. If moving from 15.25-inch x 32-inch Lab Finish Bravo 1, use the 15.3-inch x 30-inch Lab Finished Maximus. 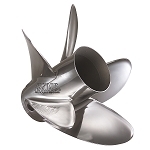 The full 15.63-inch diameter works the best with high X, step V-hulls with notched transom. 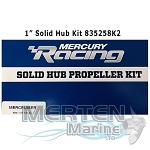 In some cases, if the transom is lifting at WOT with the long tub, consider using the short tube typically settling the stern and offering 2-3 MPH increase. If using full 15.63-inch diameter with the XR Sport Master Shorty the anti-cavitation plate must be removed. 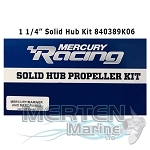 Mercury Racing Maximus propellers are designed for high-performance, high gearcase drive height sterndrive applications. 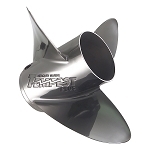 Excellent top speeds, great handling, good mid-range speeds and eye-popping planing performance for V-bottoms, Cats and Step hulls. 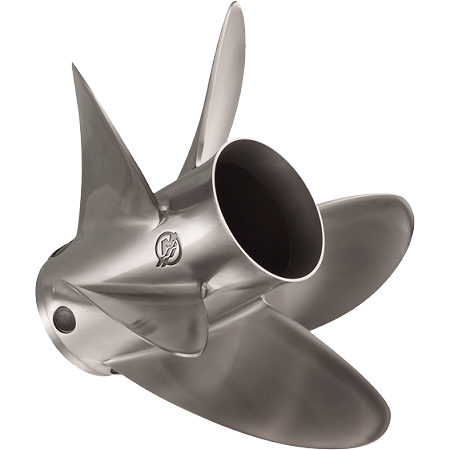 This is the prop of choice for reducing high slip with Step hulls.